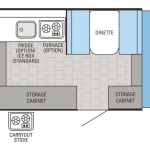 The Jay Series Sport is Jayco’s lightweight, entry-level line of pop up campers. 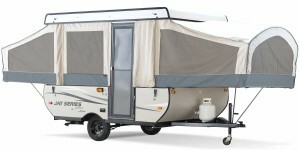 Designed for new pop up camper owners who are just moving up from tent camping, and for owners of smaller vehicles that need a lighter option, the line includes a number of the same features and specs you find in the larger Jay Series rigs, such as bunk platforms that are rated to support over a thousand pounds each. 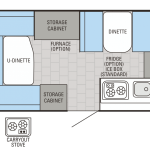 There are currently three different floor plans available in the Jay Series Sport lineup, each of which includes two pop-out beds and a convertible dinette, with sleeping accommodations for at least five or six people. 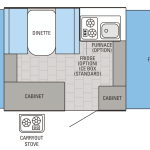 Jay Series Sport 10SD profile. Courtesy Jayco.